Network disaggregation is one of those topics that seems almost to be taboo in some circles. A colleague of mine once told me that if I talked about the subject with too many people, pretty soon I would gain a reputation as “that weird guy” who thinks he can build his own switches. He may be right. But, the advance of all kinds of technologies, the quality we find in open source software these days, and the falling cost of hardware might one day conspire to make home-grown disaggregation look pretty attractive. The purpose of this post is to show, using a step-by-step example, how one would go about building a network using commodity components and open source software. I’ll also throw in a twist – I’ll show how we can implement something that many of us are asking for from the big vendors, an API. I’ll use this as a way of showing what it looks like to be in control of your own destiny in terms of features and capabilities on a networking platform. Now let’s take a quick look at our interfaces. Some of the detail has been omitted to save space. Start zebra. This is very important – zebra handles the kernel routing table and must be running for any quagga daemon to be able to inject routes into the kernel. 1. We have built a network out of commodity hardware components. We can use rackmount servers, or hypervisors running a linux VM, or small form-factor PCs, or whatever. We can use whatever operating system works best for our organization. 2. Using open source software, we have configured OSPF using a (mostly) familiar CLI. 3. We have verified the basic function of our network, using mostly skills that we previously learned operating vendor-supplied hardware and software. Now it’s time to take control of our own destiny and provide some good management tools for ourselves. If you’re sick of waiting for networking companies to build a decent API for you, for example, now you can build one yourself. Let’s say that REST API is what you want. One of the reasons that REST is appealing is that it’s simple to consume. REST is certainly not the only game in town for network management and automation, but its simplicity lends itself well to illustrating the point I am trying to make here. In concept, all you are doing with a REST API is sending an HTTP endpoint and verb to a web server, and then having the web server respond to you with some sort of structured data. The generally accepted format of that structured data is JSON. All of this can be done with an off-the-shelf webserver and a server-side scripting language. 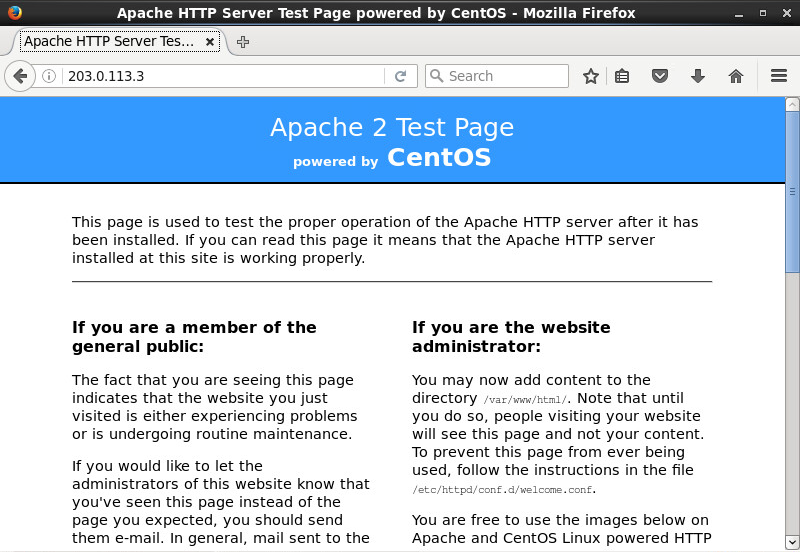 We’ll choose the Apache webserver and PHP to implement our custom REST API. 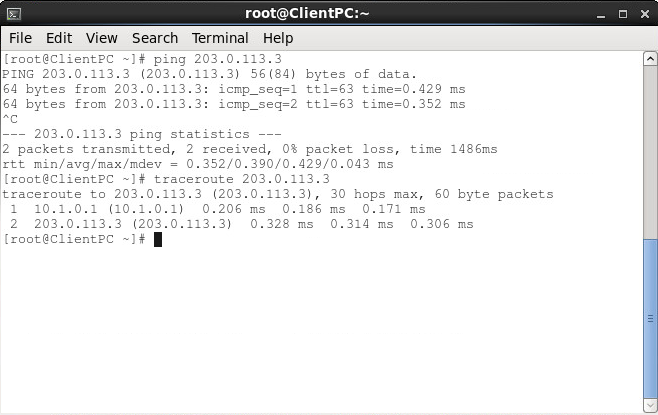 Since we want to connect to our router via HTTP, that means the router itself needs to be running the webserver and the scripting engine. Since we control the platform, all we have to do is install the software we want. 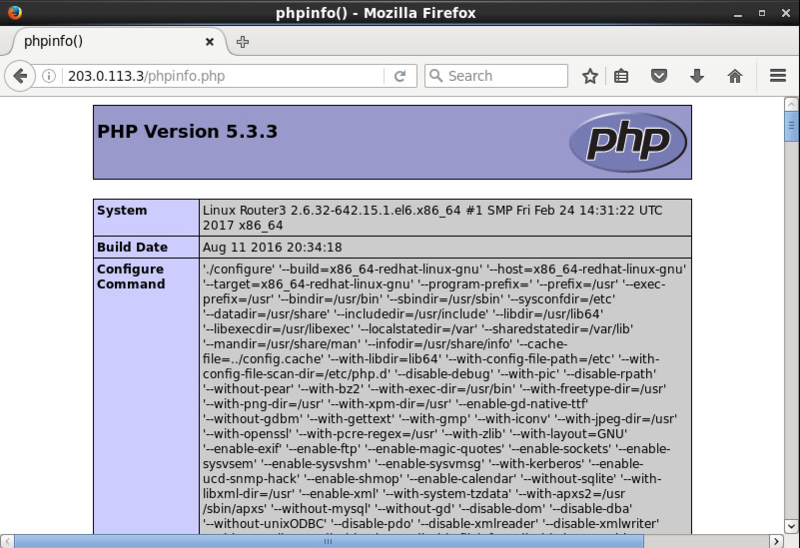 Apache and PHP have been pre-installed for this example, but it’s really just a matter of running “yum install httpd php” to get those packages. Or, if you’re into nginx instead, use that one. Or if you want to use Python or Go or whatever for your server side scripting engine…you get the idea. Since you built the platform, you are calling the shots on which capabilities to add to it. // which API call the user is trying to use. case "testrequest": //if the first part of the URL was "testrequest"
"Testing": "Your call to testrequest was successful"
We have our own REST API up and responding to client requests. It’s not doing anything useful yet. But hopefully this demonstrates one possible approach you could take to building your own networking platforms and implementing the features that we have traditionally waited for vendors to provide for us. 1. We started with some basic building blocks (some hardware, an OS, some routing code, a webserver and a scripting language). 2. 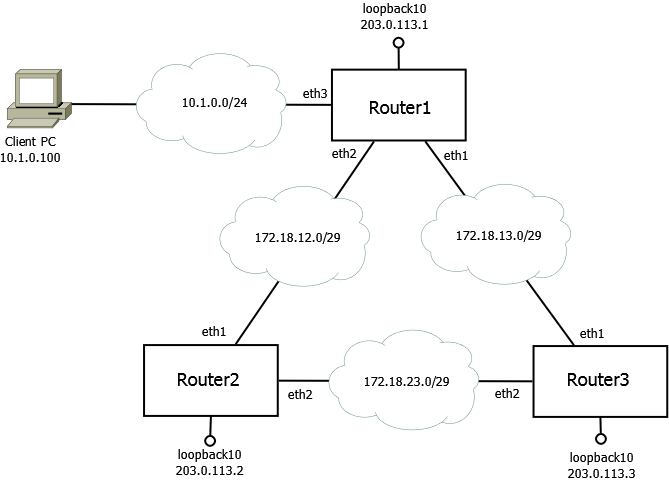 We built an OSPF network using open source routing code. 3. We wrote some custom code to add a feature that we wanted in our router – in this case, a REST API. In part 2, we’ll modify our API code to find an interesting fact about the current operating conditions of the router, and return that to our client. We’ll also include some basic security, in the form of a static API key. Thanks for the example, looking forward to the next article. With all of the focus on different packages etc, how can we as traditional network engineer get to know all of these different command line references let alone know where to look when something goes wrong? We know how to build configuration in IOS for example, but how can we familiarize ourselves with yet another CLI reference, or am I missing something? I think that when we decide we are going to work in IT, and especially in networking, we are stepping on to a treadmill. And the speed is slowly being turned up on us. The only way to stay on is to keep moving forward with new skills. Most of the guys on my teams over the years have been capable of quickly picking up linux and server stuff – I think most of us will have a much easier time transitioning into the devops mindset that Jacob mentions below than we think we will. As far as how to get familiar with all of the new stuff, I think it’s helpful once in a while to build your own server, for your own purposes. You could set up a monitoring service on linux, for example, and just use google to teach yourself until you have it up and running. You’ll find that it’s not really any harder than the stuff you have been working on for years in networking. And, as an added bonus, you’ll know better how to communicate with linux guys in your day-to-day when they need your networking expertise. I’m not sure I would expect a traditional network engineer to pickup something like this, but it is something that is going to redefine what the industry expects from a network engineer. Today, it’s enough to have your CCNA or CCIE and have a ton of router/switch/wireless work. However tomorrow, you’ll be expected to build not just one or two sites, but 50 sites with a few commands into your tooling. Yes I’m talking about Devops*, just like big cloud offerings, you’ll be expected to know how to read manpages, create playbooks, and deploy services. Systems must be designed to scale without forklift hardware. The concepts of getting ICMP working from point A to point B is no longer enough, failover is no longer enough. *Devops as defined as operations though development: It is the process of building systems through overlays and automation providing constant improvement and consistency. I fully appreciate that this is going to be expected of “us” in the future. I can see the future of networking and where our industry is going but not sure at the moment, how I personally can start to move toward adopting this as a regular working practice. I don’t think most enterprises have the necessary experience either to get ahead of the curve in terms of adopting this. The existing tools are so embedded in to our every day work that moving to something new can be a difficult move. The next 5 years should be an interesting few years in the industry.